Keep on swimming and get a chance to swim next to sea turtles in Talisay Point! Share your experience with others! 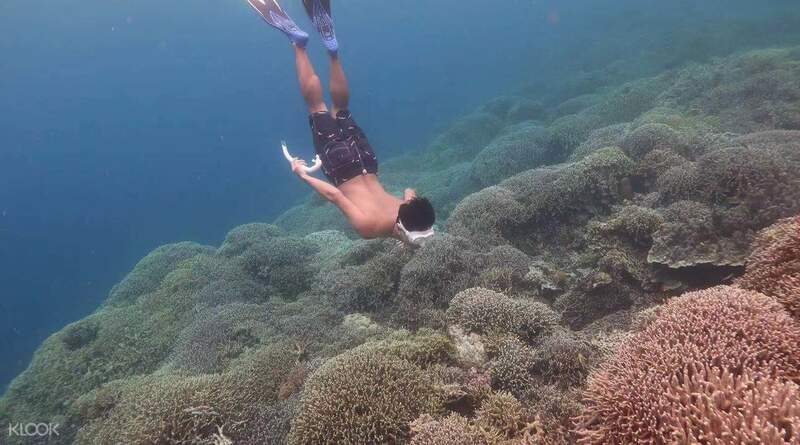 Join a group tour on Klook's Pescador Island Snorkeling Join In Day Tour! We loved the Sardine Run. 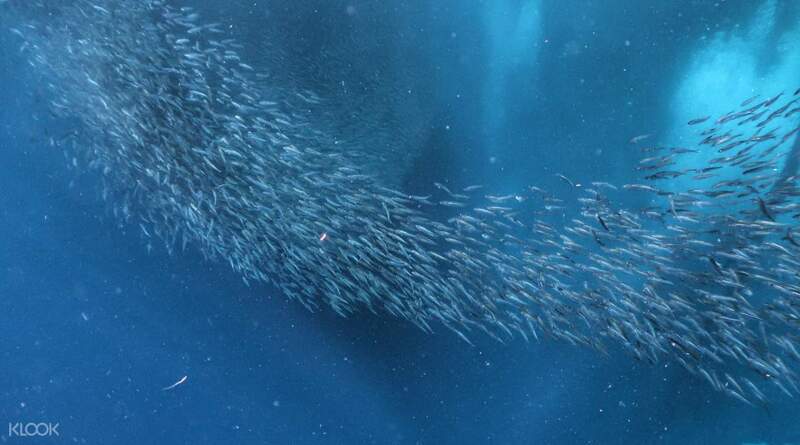 It was awesome and we can't get enough looking at the sardines moving into different formations. We also availed an upgrade to add Badian Canyoneering. It was such a great experience that will push your boundaries. All the tour guides we had were very friendly and accommodating, especially Godio. They ensured we enjoy the place, but most of all, conscious that we're safe all the time. 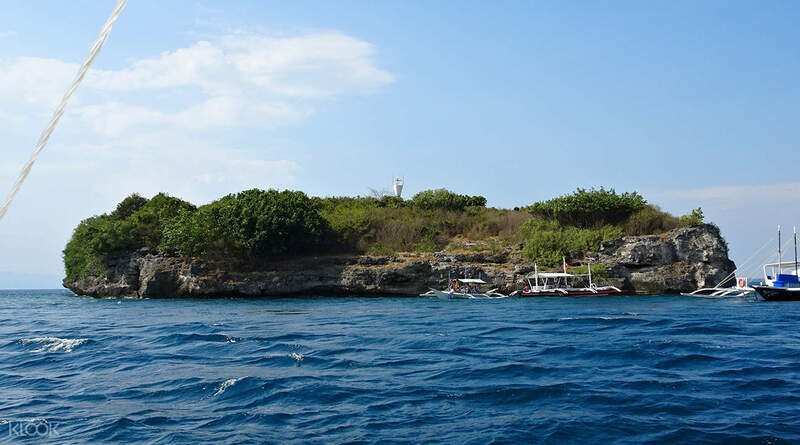 Pescador Island's rich biodiversity is yours to explore in this thrilling snorkeling tour! In this amazing journey, you'll be going on a journey to dive into the blue waters and enjoy snorkeling among the gorgeous underwater life found in the island. Your stop at the this world-class diving and snorkeling location will allow you to see protected corals and examine the marine species that call it their home. The marine sanctuary will allow you to swim among the fish and even feed them! You might even get a glimpse of sea turtles as you go! Cebu's famous sardine run is one adventure you also can't miss: you'll find yourself surrounded by huge schools of swimming sardines! You chance to swim with sea turtles in Talisay Point is next, and after this comes an amazing boat ride that'll get you glimpsing dolphins playing in the sea. This journey will conveniently take you to and from your hotel, allowing you to focus on creating priceless underwater memories. Dive in and swim among beautiful fish and corals! You'll swim with a myriad of fish species and might even glimpse sea turtles! Aboard a boat, you'll cruise over the waters and catch sight of dolphins! My friends and I booked this tour through Klook. We received the vouchers immediately after we paid for them. The tour was beautiful from start to finish. It was well-organised and the staff assigned to us were very friendly and accommodating. Would definitely avail of their services again! My friends and I booked this tour through Klook. We received the vouchers immediately after we paid for them. The tour was beautiful from start to finish. It was well-organised and the staff assigned to us were very friendly and accommodating. Would definitely avail of their services again! It was an amazing experience. The Pescador Island has beautiful corals and fish surrounding it. The water is so clear that you can see everything clearly in the water. The ferry owner also let you go free and easy. It's really an incredible experience. It was an amazing experience. 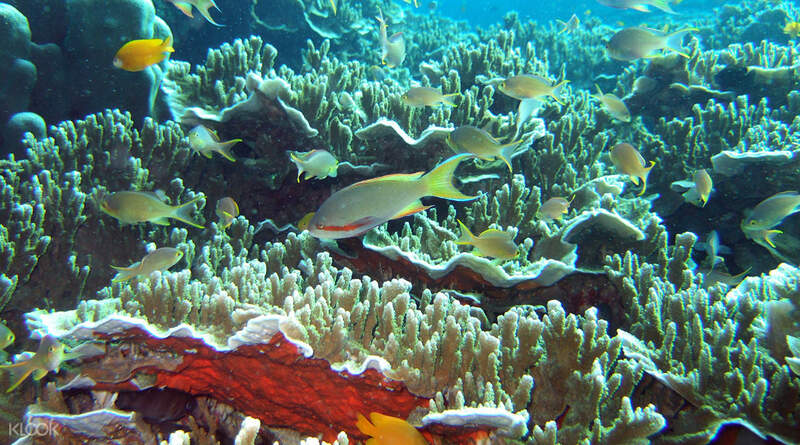 The Pescador Island has beautiful corals and fish surrounding it. The water is so clear that you can see everything clearly in the water. The ferry owner also let you go free and easy. It's really an incredible experience. Driver so nice, he prepare the towel for us. I saw wall of sardine and turtle is so cute. Note i forgot change date in camera so the date is not correct. Driver so nice, he prepare the towel for us. I saw wall of sardine and turtle is so cute. Note i forgot change date in camera so the date is not correct. We booked a private tour for 2 and requested to visit extra destinations - Simala Shrine and Kawasan Falls (at additional surcharge of 500php and 700php respectively). The driver picked us up at 7am punctually and we headed to the Simala Shrine first before the snorkelling activity at Pescador Island. This tour is recommended for people who are unable to swim because the guides were so helpful and would use a lifebuoy to navigate in mid ocean for you to see sardines and even a sea turtle! They also helped us to take nice pictures as well 😃 Overall a very recommended tour! Lunch is not included so it’s best to make an arrangement with the driver on when and where you would like to have lunch. We booked a private tour for 2 and requested to visit extra destinations - Simala Shrine and Kawasan Falls (at additional surcharge of 500php and 700php respectively). The driver picked us up at 7am punctually and we headed to the Simala Shrine first before the snorkelling activity at Pescador Island. This tour is recommended for people who are unable to swim because the guides were so helpful and would use a lifebuoy to navigate in mid ocean for you to see sardines and even a sea turtle! They also helped us to take nice pictures as well 😃 Overall a very recommended tour! Lunch is not included so it’s best to make an arrangement with the driver on when and where you would like to have lunch. We had our Pescador Snorkeling tour yesterday. Once you booked the trip in this app they will send you the confirmation voucher thru your provided email and then you will be contacted by (Trek and tours) for the details of the driver + hotel pick up confirmation by email or text message. I made a last minute booking and got a quick response-very reliable!!! Once you reach Moal Boal, a local guide will meet you and asked you to register(that's only for accountability). Next, you have to attend the 5 minutes briefing for do's and don'ts. Afterwards, we took a banca boat that will take atleast 30 minutes going to the Pescador Island and our itinerary goes on. If you don't have packed meals. Don't worry there's numerous restaurant near the Sardine run spot. We had lunch at Lantaw restaurant. They offered Filipino,Indian, Chinese cuisine, pasta and wine too. A shower room is provided for free use but don't expect too much about it. It's for public use so it wasn't well maintained. Bring your own bathroom toiletries. Overall, it's a memorable experience that we wanted to try again. We had our Pescador Snorkeling tour yesterday. Once you booked the trip in this app they will send you the confirmation voucher thru your provided email and then you will be contacted by (Trek and tours) for the details of the driver + hotel pick up confirmation by email or text message. I made a last minute booking and got a quick response-very reliable!!! Once you reach Moal Boal, a local guide will meet you and asked you to register(that's only for accountability). Next, you have to attend the 5 minutes briefing for do's and don'ts. Afterwards, we took a banca boat that will take atleast 30 minutes going to the Pescador Island and our itinerary goes on. If you don't have packed meals. Don't worry there's numerous restaurant near the Sardine run spot. We had lunch at Lantaw restaurant. They offered Filipino,Indian, Chinese cuisine, pasta and wine too. A shower room is provided for free use but don't expect too much about it. It's for public use so it wasn't well maintained. Bring your own bathroom toiletries. Overall, it's a memorable experience that we wanted to try again. It was an overall enjoyable experience there was perfect weather and we were able to spot 5 sea turtles. Unfortunately we were also stung by a few jelly fish as well. The sardine run was unbelievable. It was an overall enjoyable experience there was perfect weather and we were able to spot 5 sea turtles. Unfortunately we were also stung by a few jelly fish as well. The sardine run was unbelievable. We loved the Sardine Run. It was awesome and we can't get enough looking at the sardines moving into different formations. We also availed an upgrade to add Badian Canyoneering. It was such a great experience that will push your boundaries. All the tour guides we had were very friendly and accommodating, especially Godio. They ensured we enjoy the place, but most of all, conscious that we're safe all the time. We loved the Sardine Run. It was awesome and we can't get enough looking at the sardines moving into different formations. We also availed an upgrade to add Badian Canyoneering. It was such a great experience that will push your boundaries. All the tour guides we had were very friendly and accommodating, especially Godio. They ensured we enjoy the place, but most of all, conscious that we're safe all the time. Loved the whole experience. Driver picked us up promptly at 4:30am at the hotel lobby. Slept most of the way. Traffic was quite light so it took only 3 hours to reach Moalboal. Driver stopped at a McDonalds for us to grab a 20 minute breakfast. Then it was another 10-15 minute drive to boat area. The briefing was short but clear and comprehensive. The toilet/changing area to change into swimwear was quite gross but at least it was there. The guides on the boat were friendly and made sure we were safe and didn't swim out too far. The spots were amazing, from Pescador Island's coral reef and all the pretty fishes, to the insane sardine run (there were SO MANY of them, it was almost creepy), and we also managed to see a sea turtle up close! Although the itinerary said that it would conclude at 12:30pm, we actually finished the whole tour before 10 am. We were back at our hotel before 2 pm and had the rest of the afternoon free to do other things. Also, while this activity might be a bit pricier than the other popular activities, I really appreciate that we didn't have to deal with a lot of other tourists as there were fewer people around, we had the whole boat to ourselves, and the purity of the snorkelling spots was very strictly maintained - the water was clear and clean and the ecosystem was respected. P.S. there's jellyfish in the water and we got stung a few times, so wearing long-sleeved rashguard is recommended. Loved the whole experience. Driver picked us up promptly at 4:30am at the hotel lobby. Slept most of the way. Traffic was quite light so it took only 3 hours to reach Moalboal. Driver stopped at a McDonalds for us to grab a 20 minute breakfast. Then it was another 10-15 minute drive to boat area. The briefing was short but clear and comprehensive. The toilet/changing area to change into swimwear was quite gross but at least it was there. The guides on the boat were friendly and made sure we were safe and didn't swim out too far. The spots were amazing, from Pescador Island's coral reef and all the pretty fishes, to the insane sardine run (there were SO MANY of them, it was almost creepy), and we also managed to see a sea turtle up close! Although the itinerary said that it would conclude at 12:30pm, we actually finished the whole tour before 10 am. We were back at our hotel before 2 pm and had the rest of the afternoon free to do other things. Also, while this activity might be a bit pricier than the other popular activities, I really appreciate that we didn't have to deal with a lot of other tourists as there were fewer people around, we had the whole boat to ourselves, and the purity of the snorkelling spots was very strictly maintained - the water was clear and clean and the ecosystem was respected. P.S. there's jellyfish in the water and we got stung a few times, so wearing long-sleeved rashguard is recommended.